BONE DRY is a penetrating, permanent concrete waterproofing sealer. Originally developed to seal concrete for hazardous waste containment applications, it accelerates the drying time for concrete and is an inexpensive product for sealing concrete prior to installing Vinyl, VCT or Wood Flooring. It is non-toxic and easy to apply. 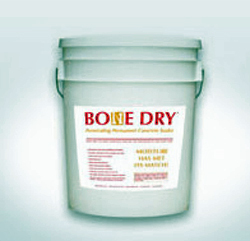 Contractors have been using Bone Dry for more than 35 years without call backs, failure or job down time.